Our Top 15 Must Have Kitchen Gadgets for your Wish List is a great list to come back to tme and time again, not only for yourself, but for gifts too! We tried to narrow it down to our favorite “Top 10 Kitchen Gadgets and Tools”, but we couldn’t do it, so here are our favorite top 15! You asked for it and we are giving it to you!! We know some of these small appliances can be expensive, so now is the perfect time to get them on Black Friday or Cyber Monday. We have provided all of the links for these products if you are interested. You can choose whatever product and size is best for your family! We are taking the month of December off of cooking classes, but stay tuned in the new year. Merry Christmas and Happy Holidays!!! #2- Cuisinart Food Processor – I use this appliance for shredding cheese, making salsa’s, dips, hummus, cauliflower rice, slicing vegetables, etc.. The possibilities are endless with this appliance. Click here to purchase the largest one available with a 14 c. capacity. If you have a smaller family and prefer the 8 c., click here. #3- Kitchen Aid Stand Mixer– This is the 6 qt. professional mixer that will give you the space to do several loaves of bread at one time or make a double batch of cookies. I make all of my cookies, muffins, & cakes in this baby! It’s the largest bowl size. Click here if you want the 6 qt. size. If you prefer the 5 qt., click here. #4- Bosch Mixer– If you are into bread making, or want to start, this is the thing for you! You can make up to 6 loaves of bread in one batch. It perfectly kneads your bread and makes bread making so much easier! You can also make your cookies and cakes in here as well. I also do twice baked potatoes in mine because it can hold so much! These appliances are built so well, they could last you a lifetime! Click here to purchase. If you want one with the bowl scraper and cookie paddles too, click here. #6- Shun Knife– This is my absolute favorite knife in my kitchen. It is a 7″ Santoku Hollow Ground Knife. Everyone asks in my classes what knife this is because it effortlessly cuts through anything! It’s actually a Japanese vegetable knife, but it can do it all! I also recommend getting the Honing Steel Knife Sharpener. You should keep your good knives sharp by using it every couple times you use your knife. Then you don’t have to get them professionally sharpened as often. I promise you won’t regret this purchase!! Click here to buy. #7- Flexible Cutting Boards (extra thick)- I LOVE flexible cutting boards because they make chopping & dumping into our pots & pans so easy! These ones are extra thick which is nice because some of the cheaper, thinner ones end up cracking & being cut through. They are even dishwasher safe. Click here to purchase. #8- Garlic Press– This is the best rated garlic press through America’s Test Kitchen. I personally have the Pampered Chef one and it’s been great but the coating is peeling off. This one is stainless steel and you will never have to buy another one. Click here to purchase. 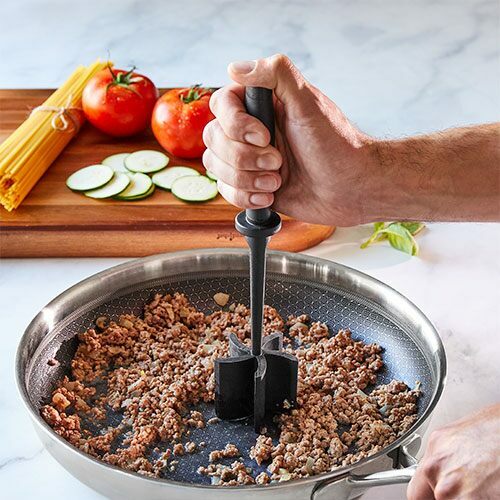 #9- Meat Chopper– I love this tool because it helps break up your ground turkey, sausage, or meat when making taco’s or any ground meat dish. After using this tool you will be so glad you have it! I have the Pampered Chef one and it’s a keeper! Click here to purchase. #11- Microplane Zester– This zester is so sharp and perfectly spaced that it gets just the zest off your citrus fruits so you can add that delicious taste to your recipes. It can even do a fine grate for parmesan cheese. Love this tool! Click here to buy. #12- Rubber Spatulas– There is nothing like a good rubber scraper/spatula in the kitchen. Oxo is a great brand as well as the Pampered Chef. Check out this fun assortment of spatulas that are heat proof up to 600 degrees and won’t warp or discolor. I think you’ll love them. Click here to purchase. #13- Lemon Squeezer– If you don’t have one of these, you should! They help you get the most out of your lemons or limes! You simply cut, turn over & squeeze! This one won’t rust because it’s stainless steel and it’s dishwasher safe. Click here to purchase. Click here for a top of the line skillet. Then look around for the right size and color for you! #15- Fine Mesh Strainer– I love a good fine mesh strainer to rinse all of my grains, especially quinoa. Quinoa is such a small grain that you need an extra fine mesh. This is a Cuisinart set that has three different sizes. It’s a steal! These strainers can be used for anything. Click here to purchase. We hope you have enjoyed our Top 15 Kitchen Gadgets! Having the right tools in the kitchen really does help with increasing productivity and having a joyful experience! For us it makes all the difference! Merry Christmas & Happy Holidays! !